Many pregnant women rely on this versatile vegetarian source of protein as an important part of their diet, but with some studies showing a negative side of soy, many women have become unclear if this food is good for them or potentially harmful to health. Some researchers have cautioned against consumption of soy protein, reporting findings that soy increases the risk of breast cancer. The results of this research, however, must be taken with a grain of salt. The research showing possible harmful effects of soy products were based on studies isolating a specific component of the soy plant, called isoflavones- namely a specific type of isoflavone found in soy called genistein. Isoflavones such as genistein act as phytoestrogens- a weak type of estrogen that activates estrogen receptors in cells, including breast and tumor cells. These isolated isoflavones are sold in a concentrated pill form marketed to menopausal women as a remedy to help relieve symptoms such as hot flashes. In postmenopausal women, high levels of isoflavones such as genistein have been linked to a higher risk of breast cancer. As only a few soybean components were isolated when conducting these studies, the conclusions of these studies are incomplete. When consuming a whole, intact soy bean, there are many biologically active ingredients that work together to have multiple effects on the body. Researches think that when a soybean is consumed in its whole form, the different compounds can interact in ways that reduce the negative outcomes that one individual component, such as genistein, may have. For this reason, the FDA limited its health claim advertising soy’s heart healthy benefits to intact soy protein- not one or two isolated constituents. Both the National Cancer Institute and American Cancer Society say that breast cancer survivors can safely consume moderate amounts of soyfoods- anywhere from a few servings a week to three servings a day. 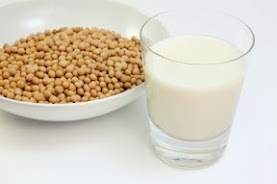 Research has even shown that intake of soyfoods may be protective against breast cancer, especially if consumed during childhood and adolescence. Additionally, soy contains many antioxidants which can help prevent chronic diseases associated with oxidative stress such as cancer, cardiovascular disease, and diabetes. Soy protein is also a highly digestible, high quality form of protein that is comparable to beef, milk, fish, and egg protein. Soy milk can be a great non-dairy alternatives that is comparable to dairy in meeting nutritional needs for protein, calcium and vitamins A, D and B12. Its ability to provide a good source of protein and calcium while at the same time being low in cholesterol and saturated fat makes it a great substitute for meat sources of protein when considering heart health. After looking at the facts we can now put to rest the ambiguity surrounding soy’s status as a healthy versus unhealthy food, and safely say that it is a great vegetarian source of protein that can be included as part of a healthy, balanced diet.